NASA astronaut Tom Marshburn snaps a photo of crewmate Chris Cassidy during a May 11, 2013 spacewalk in this view from Cassidy's helmet camera. The spacewalkers replaced an ammonia pump box while seeking a coolant leak outside the International Space Station. 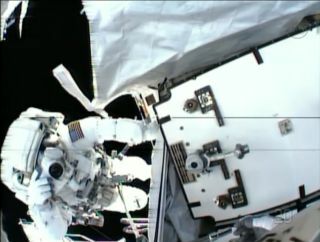 A spacewalk outside the International Space Station today (May 11) appeared to fix a leak of liquid ammonia, though astronauts and Mission Control will be in wait-and-see mode until they know for sure if the repairs succeeded. Two NASA astronauts — Chris Cassidy and Tom Marshburn — ventured outside the football field-size orbital complex to investigate a leak that had sprung in the station's cooling system, which uses liquid ammonia to transfer heat away from electronic power systems. Although they found no signs of damage that might explain the leak, the spacewalkers replaced a suspect coolant pump, which appeared to halt the flow of ammonia for now. "The crew looked and watched for any obvious signs of leaks and didn't see anything," Joel Montalbano, deputy space station program manager, said during a press conference after the spacewalk today at NASA's Johnson Space Center in Houston. "We're very happy." NASA astronauts Chris Cassidy (top) and Tom Marshburn work outside the International Space Station after replacing an ammonia coolant pump on May 11, 2013. Engineers on the ground will continue to study the troubled area in hopes of understanding what caused the leak. "We'll see if anything becomes obvious," said NASA flight director Ed Van Cise. "From what we saw during the EVA [extravehicular activity, or spacewalk] itself, nothing really stood out in terms of what may have been the culprit." NASA officials said they don't yet know if the problem is related to a leak that was spotted in the same coolant channel in 2007. That leak was so slow it posed no immediate problem, and a November 2012 spacewalk that replaced a radiator for the system appeared to stop it. On Thursday (May 9), the six-man crew of the space station's Expedition 35 mission noticed the leak had worsened, with visible white snowflakes of frozen ammonia floating out into space. "It was just two days ago that the slight leak we were observing in the thermal control system took a change to where it was a pretty dramatic leak," Van Cise said. The urgency of the problem caused NASA to "pretty much bring everyone to the table" to address the situation and plan the spacewalk at the last minute, he added. "Space station is a very large, complicated and complex vehicle built all across the world. There are going to be engineers and very smart people all over the place that need to help us address these situations. We draw upon that when we have to and when the vehicle throws something at us that we need all those resources." For now, mission managers are breathing a sigh of relief, though only time will tell if the issue is truly resolved. "It's going to take the teams a few weeks to go ahead and watch the system, understand the system … before they're ready to tell us that we were 100-percent successful," Montalbano said. In the meantime, the crew is preparing for a change of command ceremony tomorrow (May 12), where current Expedition 35 commander Chris Hadfield of the Canadian Space Agency will pass the duty over to Expedition 36 commander Pavel Vinogradov of the Russian Federal Space Agency. Hadfield, Marshburn, and Russian cosmonaut Roman Romanenko will depart the space station Monday evening at 7:08 p.m. EDT (2308 GMT) on a Russian Soyuz spacecraft and land about three hours later, at 10:31 p.m. EDT (0231 GMT Tuesday), in Kazakhstan. A new crew of three spaceflyers is due to arrive at the space station later this month to round out the Expedition 36 team.